This herb pack is designed to fit snugly around the lower back area. 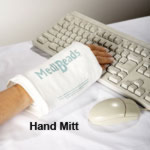 The hot pack attaches so that the person can continue doing daily activities while getting the relief that they need. The microwave hot pack can also be strapped diagonally across the upper back and shoulder areas. This reusable heat pack fits waists up to 48 in. This herbal heat pack measures 13 in by 7 in. The herb pack can also be used for cold therapy by placing in plastic bag and chilling in the freezer. Patterns may vary from those pictured.